A surprise package for who are looking around an affordable and cost effective variant mobile computing, iPad Mini is surely a hit among Apple fans. Facilitated with a 7.9 inch screen, the iPad mini is provided with all the necessary features for a modern day mobile geek. It does all including taking pictures, surfing the web, watching video, reading books and listening to music as well. It is Apple’s 4th generation iPad though smaller in size accomplishes all the features of other generation iPads. Watching movie or surfing a website provides the same measure of usability features on the iPad mini like other versions of the iPad. 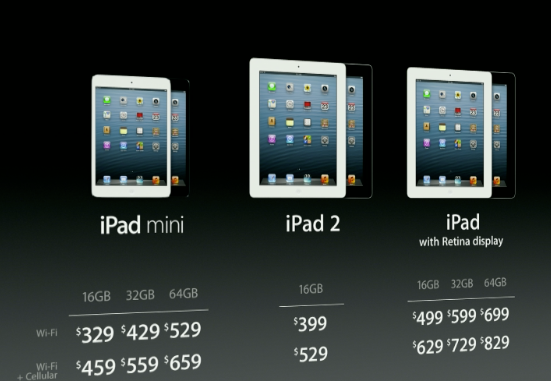 An iPad Mini with 16 gigabytes of storage comes around at cost of $329. And it is offered in an exciting range of colours as well.